This was my last rig as of 3-15-08. I split everything up into 2 rack cases. 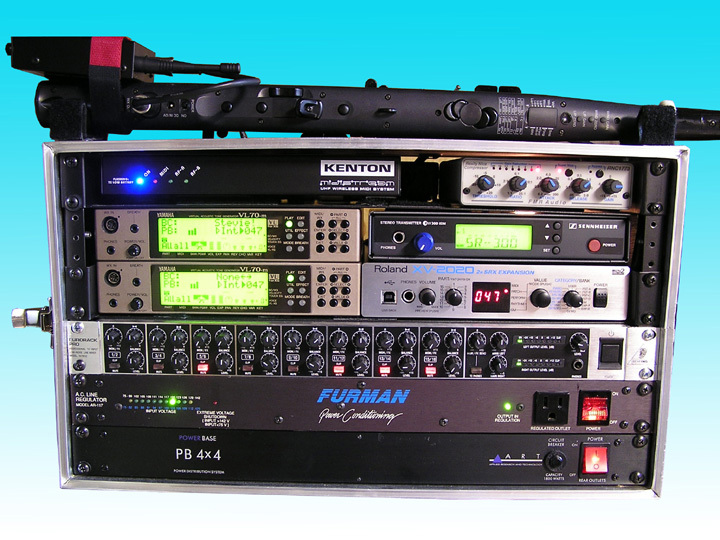 The main Rack is a Rok Sak 4 space. It is plywood covered in nylon. It is durable yet light and easy to carry. 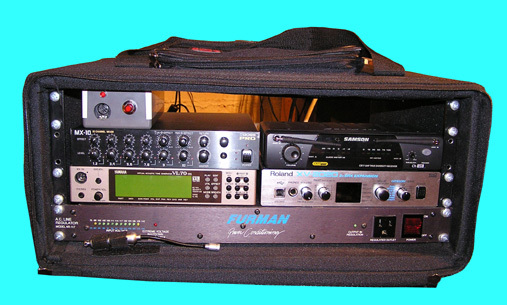 Here I have 3 VL70m's with Turbo Chips, a TOA D3 Mixer, the new Synthophone Power Supply, and a Quadra Merge. 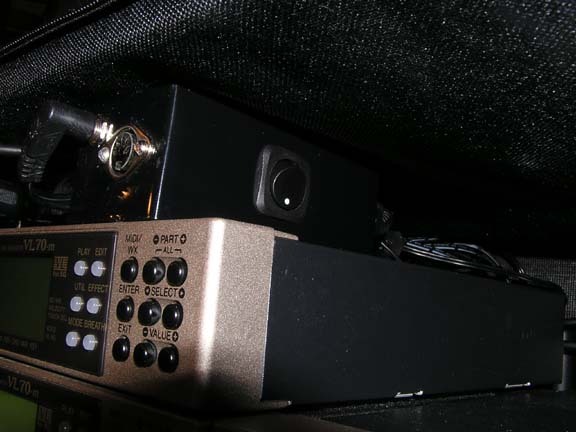 In the Gator 3 space rack Bag there is the Kenton wireless Midi Receiver and the Furman Power Conditioner/ Voltage Regulator. 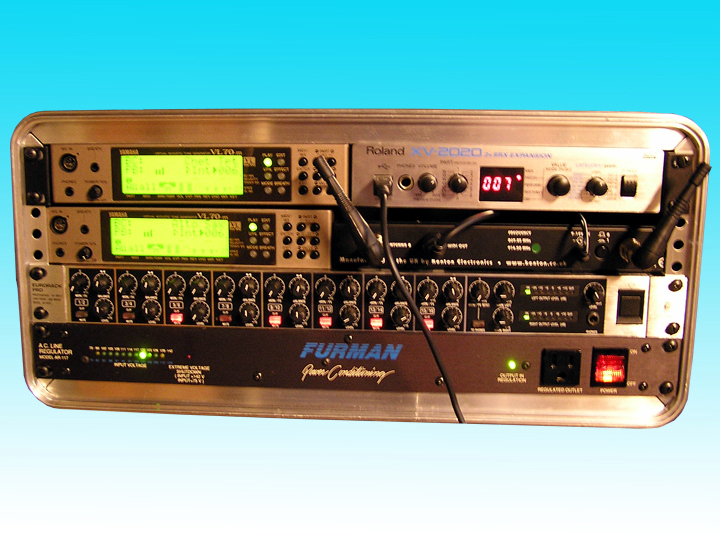 Below are a "few" of the many rigs I have assembled since about 2002. Rig as of 9-23-06. Simplicity makes for less weight, less connections to come undone, and it is easier to make clean layering of the synths. 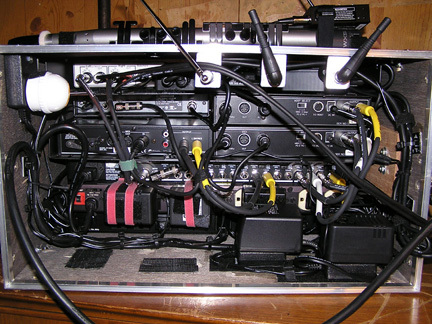 This was the rig that is in a 4 space effects rack prior to dropping another VL70-m in favor simplicity . It was a bit of a task getting everything to fit but all of the components and wiring are very snug and secure. 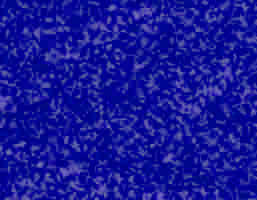 The Bose PAS allowed for a reduction in components. (( update 5-29-07)) I have returned to basically this same setup. Two VL's are real nice for layering sounds. Eventually I will have 3 back in my rig. The horn section sounds and other layers are pristine , and very authentic sounding. I would have to sacrifice only a few sounds in the XV to go this way again. Below is a view of the actual wiring. Everything is secured with wire ties ,and velcro. Note the Antenna mounts. For both the Sennheiser Wireless In Ear Monitor , and the Kenton. I have installed antenna extensions to allow rack mounting. 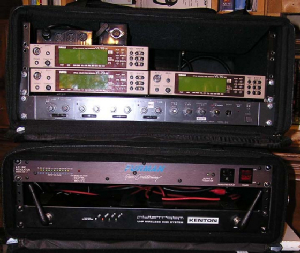 This is the old rig before it was modified and downsized.